LOUISVILLE, Ky. — After 79 years, the Kentucky Guard knows a thing or two about assisting the City of Louisville with the security of the Kentucky Derby. Since 1936, the commonwealth’s Citizen-Soldiers and Airmen have been involved with the colossal task of ensuring the safety of more than 250,000 spectators at the Kentucky Oaks and Derby weekend. That tradition continued for the 141st running of the historic races at Churchill Downs, May 1-2. 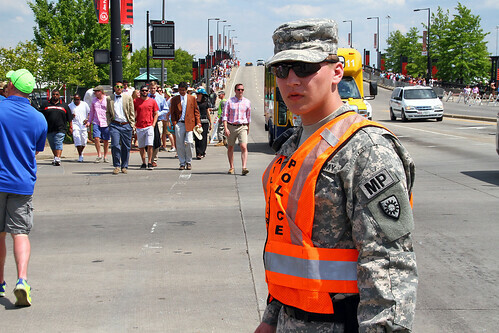 More than 200 Guardsmen took their usual stance in the streets around the track directing traffic and securing pedestrian gates inside as record numbers of spectators jammed Churchill Downs. 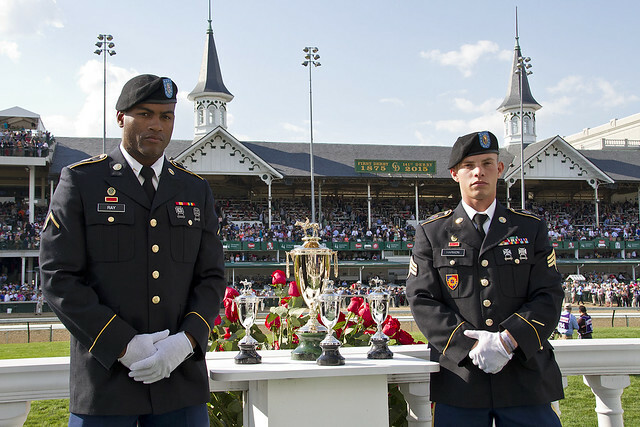 Soldiers and Airmen were also on hand for security in the winners circle and a select few were tasked with guarding the Kentucky Derby Trophy. Of the roughly 200 Citizen-Soldiers, a good number of them were working their first Derby. Davisson said the 198th’s history of working the Derby has provided a wealth of experience that has been passed on from NCOs to younger Soldiers to continue the success of the operations. Among the new faces at the track was 2nd Lt. Sarah Powell who, even as a freshly appointed MP officer, served as officer-in-charge of security. Pvt. 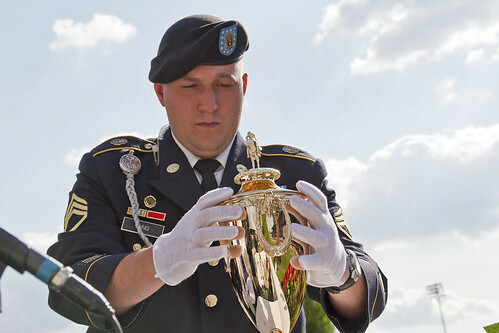 Demitri Ray with the 617th was working his first Derby and was selected for the trophy detail that secured the “priceless” Kentucky Derby Trophy. He has only been with his unit since August of 2014, but his NCOs said Ray is among the best of the new recruits into the company, a reason he was chosen to assist with the prestigious assignment. Ray and the other six Soldiers escorting the trophy were certainly in the spotlight of the weekend, but 198th leadership said each Soldiers on duty represented years of hard work to create such a polished undertaking. Powell said the ability to be a part of the big picture is a great benefit to the Soldiers and the units in the commonwealth. “It’s interesting because you get to several levels up of operation which you don’t normally get to see and to understand what it takes to coordinate with multiple agencies and individuals within the community, which is so important in the National Guard,” said Powell.